When the publisher of Maine Boats Homes and Harbors magazine called to tell me she had chosen an image of mine for the cover of their recent issue, I didn’t imagine it was the details of boat builder John Anderson’s hands at work. I had captured the image years ago when he was restoring a lovely Q-Class sloop called FALCON, designed by Burgess and built by the Herreshoff Manufacturing Company in 1926. I realized that I have been capturing these details of just about every boat builder I have photographed over the years, in both stills and motion. To me, the hands alone can tell the story of an artisan’s life. The way they look, with scrapes, cuts, callouses, scars (sometimes missing fingers) and the way they work the wood with force, agility and exactness. Last winter, I put together a short film edit of these hands. l never posted it, and it got pushed aside as I was busy with other ‘paying’ jobs. When the magazine cover came out last week, I thought I’d take the time over the rainy weekend to polish it off and put it out there. Short and sweet, this is a testimony of some truly talented craftsmen in this industry. The restoration of NY40 MARILEE was truly remarkable, and the response to the documentary film "NY40 MARILEE: Restoration of a Herreshoff Classic" has been amazing! One of the more fascinating challenges of the restoration was the owner's desire to accommodate both a gaff and Marconi rig. HOW DO YOU GET TWO BOATS IN ONE? Bring out the chainsaw, of course! Check out this excerpt from the full-length film that explores how the crew at French & Webb in Belfast, Maine, engineered an interchangeable rig. These artisans are truly genius. SEE THE FILM ON A BIG SCREEN! THREE new opportunities to see the film on a big screen are coming up soon in Maine and Rhode Island. On Thursday, August 2, I will be presenting the film at the Camden Yacht Club's Sunset Seminar as part of the Eggemoggin Reach Regatta events. The film will show at 7pm. Immediately following, a panel discussion and Q&A session will include myself as well as Todd French of French & Webb, Dennis Gunderson of Team MARILEE and Paul Waring of Stephens Waring Yacht Design. I'm thrilled to be surrounded by such talented professionals and hope that you will attend! We've also been entering the documentary in film festivals and have received our first confirmation that the film will be shown at the Flickers Rhode Island International Film Festival! There are two showings scheduled at this time: Wednesday, August 8 at 4pm at the Newport Public Library, and again on Saturday, August 11 at 1pm, at the North Kingston Library. Click here for more information. As more screenings are announced, we'll be posting them here, as well as on Facebook. A few months ago I received an email from David Walker, executive editor of PDN Magazine, inquiring if I’d be interested in being interviewed for the magazine’s column, “What’s Your Niche?” Of course, I said yes! Having a career in photography can be a challenge, but finding one's niche is a large factor in being a success. In this interview, you’ll learn a bit about how my career as a photographer has evolved, what camera gear I use, and a bit about some of my recent projects. PDN (Photo District News), a monthly trade publication, has been a trusted source for professional photographers for over 30 years. I’m honored to be included in the July issue, available online and at newsstands now. 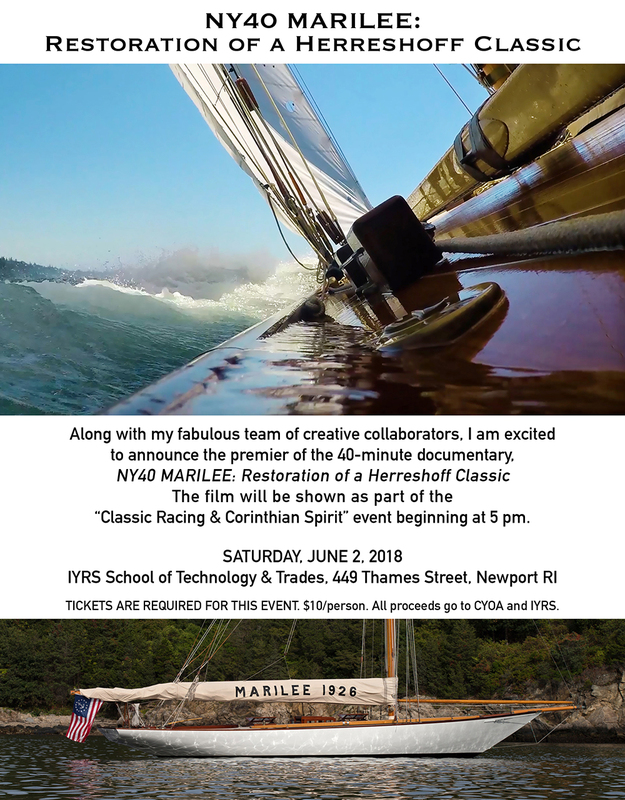 After three terrific screenings in Maine and Rhode Island, I am pleased to announce the release of the documentary, NY40 MARILEE: Restoration of a Herreshoff Classic. Over the course of two years, I followed the meticulous restoration of MARILEE, the Herreshoff classic New York 40 racing yacht, at French & Webb in Belfast, Maine. Along with documenting her restoration and racing program, we dove into the Hart Nautical Collections at the MIT Musuem to explore her extraordinary history and place in the legacy of Captain Nat Herreshoff and the Herreshoff Manufacturing Company. The result is an amazing story and stunning imagery that we are thrilled to release to the world. This film has been made available to the public due to the generosity of the current custodian of MARILEE. We are pleased to be able to share this story of the genius yacht designer and the preservation of a piece of American history. Last weekend at IYRS in Newport, RI, we premiered the film, "NY40 MARILEE: Restoration of a Herreshoff Classic". A huge THANK YOU to everyone who was in attendance! Special thanks to (pictured L-R in group photo) Dennis Gunderson; Todd French of French and Webb; Kurt Hasselbach of the Hart Nautical Collections at the MIT Museum; Paul W. Waring of Stephens Waring Yacht Design; Evelyn Ansel of the Herreshoff Marine Museum/America's Cup Hall of Fame and the MIT Museum; film editor Pedr Seymour; and Bill Lynn, president/executive director of the Herreshoff Marine Museum and president of the Classic Yacht Owner's Association. Their involvement in this film - both on screen and behind the scenes - was instrumental in its success. I look forward to sharing the film at more venues this summer, and details will be announced soon! Photo credits: Jane Kurko. For over two years, I followed the meticulous restoration of MARILEE, the Herreshoff Classic New York 40 racing yacht at French & Webb in Belfast, Maine. Documenting her restoration and racing program, in both stills and video, has resulted in an amazing story and stunning imagery. Check out the April issue of YACHTING WORLD which features highlights of the restoration. Thanks to Dennis Gunderson, Todd French of French & Webb, John Snyder, and members of the MARILEE racing team for their contributions to the story. The documentary film will be screened at various yacht clubs and events, and will later be released for public viewing online. For the past two years, I have been photographing and filming the restoration of the iconic Nathanael Herreshoff-designed New York 40, MARILEE. In October, 2015, MARILEE was brought to French and Webb in Belfast, Maine for what was going to be a minor rebuild. It was soon discovered that a major restoration was in order. This two-year restoration was tremendously successful due to the collaborative effort of many artisans, engineers, curators and crew whose passion and commitment to the project were beyond compare. This was not your ‘typical’ restoration of a wooden classic. Modern innovations and engineering were combined with meticulous and artistic craftsmanship. With access to the original Herreshoff Manufacturing Company’s building plans, documents and images archived at MIT’s Hart Nautical Collections and the Herreshoff Marine Museum, this restoration turned out an amazing yacht with an equally amazing story. Along with my fabulous team of creative collaborators, I am excited to announce the upcoming documentary film on the history and restoration of MARILEE. I invite you to view the official trailer below. THE FIGHTING FORTIES — In 1916 the Herreshoff Manufacturing Company of Bristol, Rhode Island introduced the New York 40, a new one-design class for the New York Yacht Club. Nathanael Herreshoff’s objective was to design a competitive racer that was seaworthy enough for ocean racing as well as provide accommodations for coastal cruising. The design of the NY40 initially came under criticism for its wide beam and high freeboard—a major design shift from Herreshoff’s earlier class racers. “Flying saucer” became its moniker of the day, but it was not long before the boat’s performance was proven on the racecourse and the “flying saucers” soon became known as the “Fighting Forties.” Only four of the NY40s still remain: MARILEE and her sistership RUGOSA II (the last two NY40s built in 1926), along with ROWDY and CHINOOK. MARILEE is back to fighting in her true spirit with many recent notable regatta wins and awards, and her team looks forward to joining the other historic Fighting Forties on the racecourse soon. The full forty minute documentary will be premiered June 2nd at the International Yacht Restoration School (IRYS) and following venues along the New England coast over the summer.